There are several ways to treat Gum Recession when necessary. 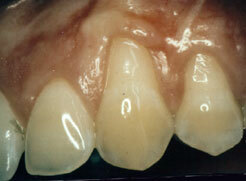 In addition to the conventional options for grafting gums, Drs. 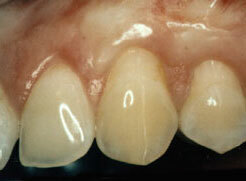 Mandel, Keiser, and Joseph also utilize a Minimally Invasive Tunnel Approach to Gum Grafting. Minimally Invasive Tunnel Approach to Gum Grafting is a technically demanding but effective grafting procedure to augment or replenish lost or compromised tissue. An accellular dermal matrix is tunneled across the root structures of the lower front teeth. A tunneling procedure is superior to conventional gum grafting procedures because no incisions are made in the areas of recession. A proprietary suturing technique is used to create the normal snug fit for each tooth while simultaneously raising the gum line higher, thereby reversing the appearance of a minor receding gum line.